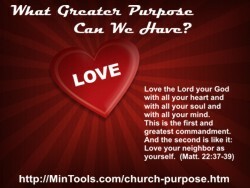 When asked about the Greatest Commandment, Jesus broke it down into two commandments. He said the “first and greatest commandment” was to love God with the whole of our being. While He stressed that love for God is our number one priority and that He gets our “all”, He went on to mention the second priority — loving others as we love ourselves. Loving God with “all” of who we are doesn’t mean we forget people or that we don’t etch out time to take care of ourselves. Love for God spills over into loving others. We can’t love God without loving people (1 Jn. 4:20). Our love relationship with God is what makes it possible to love others. Notice the command: Love your neighbor. Jesus used the same Greek word when telling us to love God and to love people — agapao. If love for God and people is going to permeate our schedules, then we need a love that finds its source in God. We can only prioritize our lives this way because He first loved us. We need to know and rely on His love (1 Jn. 4:16) if we are going to extend that love. Agape love is a sacrificial love that willingly lays aside personal agendas to think of others’ needs and interests, that thinks of the good of others over one’s own comfort and convenience. Are you taking time out of your personal schedule to bask in the love of God so you have fuel for loving others? Or, are you so preoccupied with what you have to do that you rarely even think about His love? Notice the standard: Love your neighbor as you love yourself. Of great importance to note is that we are to love others as we love ourselves, not as we love God. We should always give Him the first and foremost place. Loving others with all of our heart, soul, mind and strength puts people in a spot only God deserves. Such a love for people is idolatry. The little word “as” suggests that what follows is what we should compare love for people to. Just as we tend to our own welfare, so we should be looking out for the good of others. As you look at your schedule do other people and yourself come second? Or, are you so controlled by your own pleasures and the demands of others that God takes second, or third, place? We should also note that loving others does not mean we forget about ourselves. By using love for ourselves as the standard for loving others, Jesus seems to be implying that there is a healthy form of self-love. We need to take care of ourselves so we can give of ourselves to God and then to others. People who lose themselves to the whims of others do not love themselves in a good way. Do you love yourself, and especially God, enough to set healthy boundaries in your schedule? Or, do you let yourself get so busy that the stress of trying to be everything to everybody wears you down to the point of rendering you ineffective? Next → Next post: Staff Evaluations: Done with Integrity?